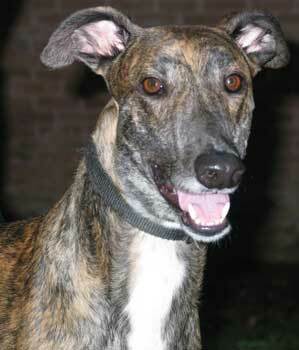 Slim is a handsome dark brindle 2-year-old boy with a stunning white blaze on his chest. His age is estimated as his tattoos are illegible. 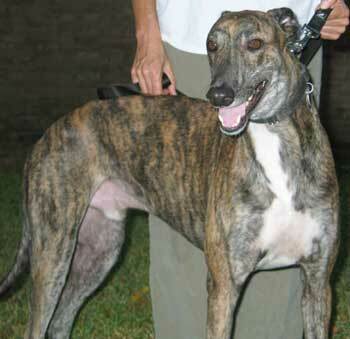 Slim came to GALT from the Town Lake Animal Facility in Austin, TX, where he was picked up as a stray. This boy is playful, chases and brings back balls, loves toys and gets along with other dogs, both males and females. He is very affectionate and loves to lay next to you on the floor and cuddle. He travels well in the car, and loves the outdoors. He is very easy to handle and readily allows you to clean his teeth, ears, whatever. He is housetrained. Slim is on the large size but very easy to handle on a leash. He would be a great obedience dog because he is very smart and loves to please you. His foster home has a dog door, and Slim knows it well.